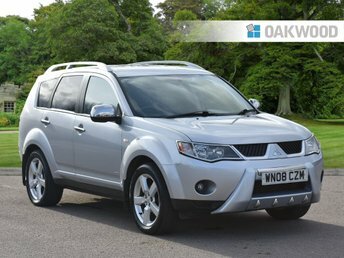 Here at Oakwood we are please to offer you this Outlander 4 work which is a 5 seats Car / Van 4x4. This great multi purpose vehicle will come supplied to you with 2 keys a MOT until 2019 and serviced on sale and has a specification list to include- 18 inch alloy wheels, auto lights, Parrot Bluetooth Kit, electric windows front and rear, Power fold Mirrors, CD Player, Rear Privacy Glass, Climate control and much much more listed below. One of Japan's major automotive manufacturers and maker of class-leading vehicles including the Mirage, Outlander and Shogun, Mitsubishi is a name you can trust when searching for a pre-owned vehicle. Start your search for a used Mitsubishi in Mansfield right here at Oakwood Motor Group. We're a leading supplier of quality second-hand vehicles and with our help you're sure to find a model to suit your lifestyle and your budget. It's simple to browse our latest range of used Mitsubishi cars here on the website, but be sure to contact a member of the team if you'd like more information or are ready to book a test drive.